iCan 1120 iPouch for 2 LIter Drum. Clear, adhesive-backed, zip-top iPouches are designed for use with iCan drums, and are ideal for holding identification tags and important documents such as MSDS sheets. Each iPouch includes 10 colored iTags (red,blue, yellow, lime green, forest green, black, orange, purple, gray and tan), that fit neatly inside the iPouch. iCan 1137 iPouch for 5/10 Liter Drum. iCan 1090 Extension Hose for 6mm Nozzle. iCan Extension Hoses screw onto the end of iCan Pour Lids, allowing an extra 11" (0.28 meters) of reach. Each pour lid has a matching size extension hose. iCan 1106 Extension Hose for 12mm Nozzle. iCan Extension Hoses screw onto the end of iCan Pour Lids, allowing an extra 11" (0.28 meters) of reach. Each pour lid has a matching size extension hose. iCan 1113 Extension Hose for 25mm Nozzle. iCan Extension Hoses screw onto the end of iCan Pour Lids, allowing an extra 11" (0.28 meters) of reach. Each pour lid has a matching size extension hose. iCan drums are made from high-densitiy polyethylene (HDPE) with UV and static inhibitors, and are designed to withstand the daily rigors of industrial environments. Each drum includes 2 blank white labels for identifying drum contents. 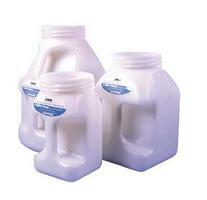 iCan lids are made from high-density polyethylene with nitrile o-rings. Pump/Storage Lids include 1" quick-fill port and two (2) accessory ports (one 1/2" NPT female thread and one 3/8" NPT female thread). Each iCan lid includes a color coding kit, which consists of: 10 different colored iTags (red, blue, yellow, lime green, forest green, black, orange, purple, gray and tan), Clear plastic iTag holders and screws (if applicable), Foam-tipped wand for pre-lubricating master o-ring located on bottom of lids. iCan 001397 Pour Lid w/ 25mm Nozzle. iCan lids are made from high-density polyethylene with nitrile o-rings. Pour Lids include a twist-open nozzle, (available in 3 different sizes), 1" quick-fill port, accessory port with 1/2" NPT female thread, light-switch style breather vent at thumb position and clear plastic handle covers that hold color-coding tags. Pump/Storage Lids include 1" quick-fill port and two (2) accessory ports (one 1/2" NPT female thread and one 3/8" NPT female thread). Each iCan lid includes a color coding kit, which consists of: 10 different colored iTags (red, blue, yellow, lime green, forest green, black, orange, purple, gray and tan), Clear plastic iTag holders and screws (if applicable), Foam-tipped wand for pre-lubricating master o-ring located on bottom of lids. iCan 001380 Pour Lid w/ 12mm Nozzle.